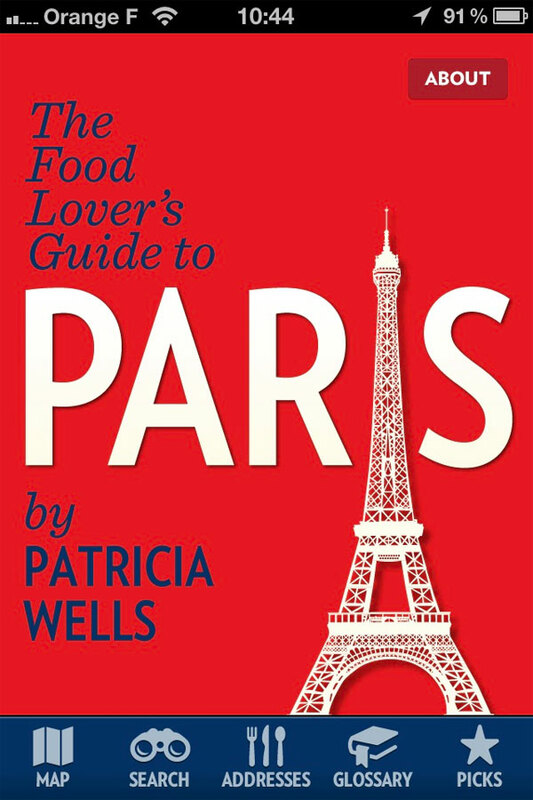 Readers have undoubtedly noticed what friends and family will tell you: we’re dedicated food lovers! And, as I’ve mentioned before on this blog, we can’t eat the same in France as at home. While we’ve had some excellent pork, lamb, and especially fish since we’ve been in Paris, ground beef is more dried out than we are used to because of its lower fat content. So, meatballs of any kind and meatloaf are pretty much out as potential main dishes. As for tacos, there’s the meat issue and, though queso fresco may be available somewhere in Paris, cheese poses another problem. I don’t know about you, but gruyère with Mexican food just does not appeal to me. After a few months of living abroad, you really start to miss some old favorites at meal time. Imagine our delight when we read a blog post by fellow American David Lebovitz that good Mexican food is available in Paris! 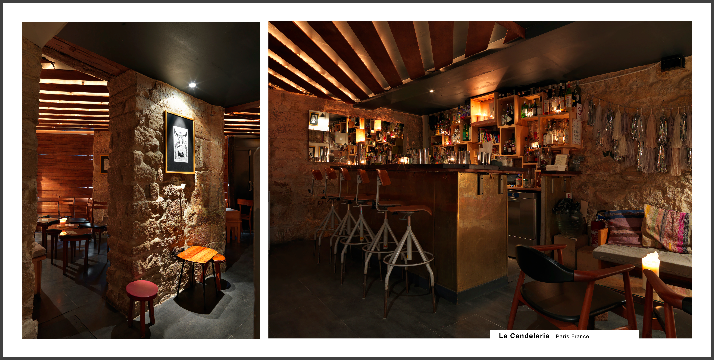 About a week ago we headed up to the 3rd arrondissement to see what Candalaria had to offer. 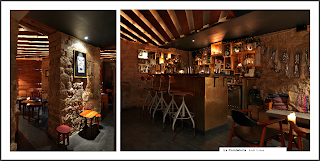 At first it seemed like the restaurant was just a small room with a kitchen, but luckily a bigger space is in the back with tables and a bar. The waitress headed over to our table all ready to explain the various menu items on the ardoise ("chalk board") to us and stopped when she realized we were Americans. Although the menu is quite limited, the basics were there: guacamole, salsa, and tacos as well as huevos rancheros, interestingly enough. The chunky guacamole was citrusy and came with very good corn chips. Our carnitas tacos were open-faced on soft tortillas and were served with small pieces of lime. We devoured every morsel! Another diner gave us a double-take when he noticed the empty salsa bowl on our table. On Friday of this week we decided to try to fill another ethnic meal need: Vietnamese food. I had bookmarked a post which discussed the best bánh mì sandwiches in Paris. 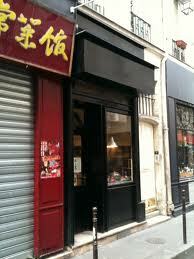 This tiny place behind a black door on rue Volta, also in the 3rd, would be very easy to overlook. When we first arrived about 11:30, the shop wasn’t yet open, but the smiling proprietor told us she was just waiting for bread and that she would be ready for business at noon. We had an errand to run and headed back there right at 12:00. The wonderful aromas inside made us immediately happy we had decided to wait for the shop to open up. The “menu” consisted of five sandwich offerings. For those who don’t know, a bánh mì usually contains some kind of meat, possibly some pickled vegetables, a spicy sauce or jalapeños, and fresh cilantro. Everything here, except the baguette, was homemade, including the chile sauce. We opted for one pork and one special bánh mì. Since there are no tables or chairs inside the shop, we had to endure the agony of having to wait to take the subway home before eating them. That part was torture but the sandwiches were heaven! 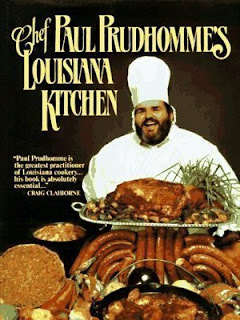 Today is Easter Sunday and instead of some traditional meal, such as a ham or a lamb roast, we’re going to attempt a version of Paul Prudhomme’s pork roast. Hopefully it’ll be as good as the other meals we’ve had reminding us of home lately. Our metro line, number four, passes through a lot of stops with saint in their names: Saint-Placide, Saint-Germain-des-Prés, Saint-Michel. On Palm Sunday we decided to drop in to the church Saint-Sulpice, which is also another subway station we hear called out all the time. We didn’t know much about the church but had heard that it was historically important and that a side chapel was decorated by Delacroix. So, despite the chilly temperatures, we took the twenty-minute walk down to its 6th arrondissement location Sunday afternoon. As luck would have it, we came in just a few minutes after a free tour had begun. The docent Danielle began by discussing the history of the building. She told us that starting as early as the tenth century there had been places of worship on this site. In the mid-1600s Bishop Olier decided to replace the small, thirteenth-century Romanesque church in favor of a more impressive one. Queen Anne d’Autriche and her eight-year-old son, the future Louis XIV, laid the cornerstone of Saint-Sulpice. In their honor, two side chapels were devoted to the namesakes of the royal family. One stained-glass window shows Saint Anne reading to her daughter, who would become the Virgin Mary; the other represents Saint Louis, the former king, with his fleur-de-lys covered gown, holding the crown of thorns he had brought back from the Holy Land. Construction of the church took nearly a hundred years, mainly because of the lack of funds. Some of the icons of the main chapel were destroyed during the French Revolution: the silver statue of the Virgin Mary was melted down and the crystal stars symbolizing her were stolen. The replacements, including a statue by Jean-Baptiste Pigalle, are still quite beautiful. During and immediately after the revolution, the structure was no longer used as a church, but as a meeting place for insurgents and even a banquet hall for Napoléon. We saw and heard so many things as part of our tour. 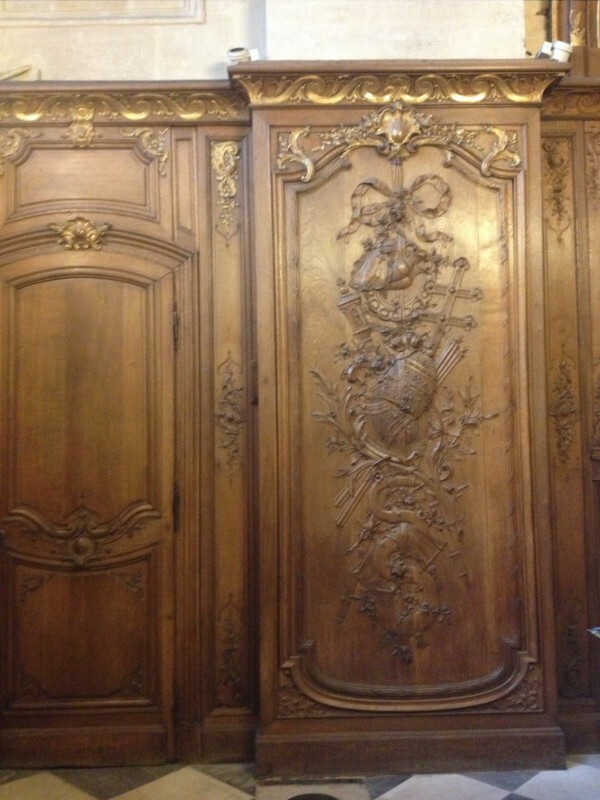 The sacristy, which has been restored thanks to a Kress Foundation grant, is lined with solid carved wood and iconography such as stars, roses, and lilies, again denoting the Virgin. 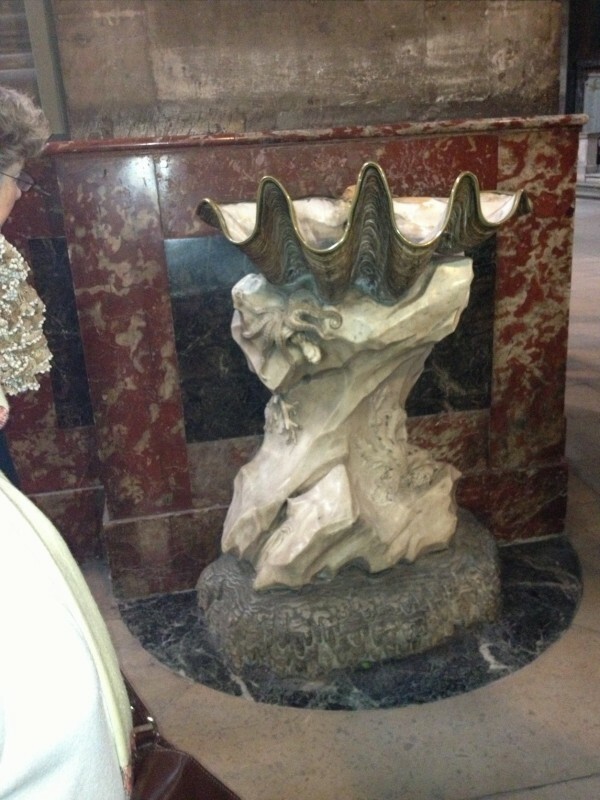 Two huge seashells were transformed, also by Pigalle, into holy-water fonts. A marble and oak pulpit is supported only by two staircases behind it. The Chapel of the Angels by Delacroix, currently under restoration, depicts angels fighting on horseback and hand-to-hand to convert sinners to a more holy life. A replacement silver Virgin is kept under lock and key in a separate room. The most unusual part of the church is the gnomon. I’m sure you’re thinking, like we were, the what? 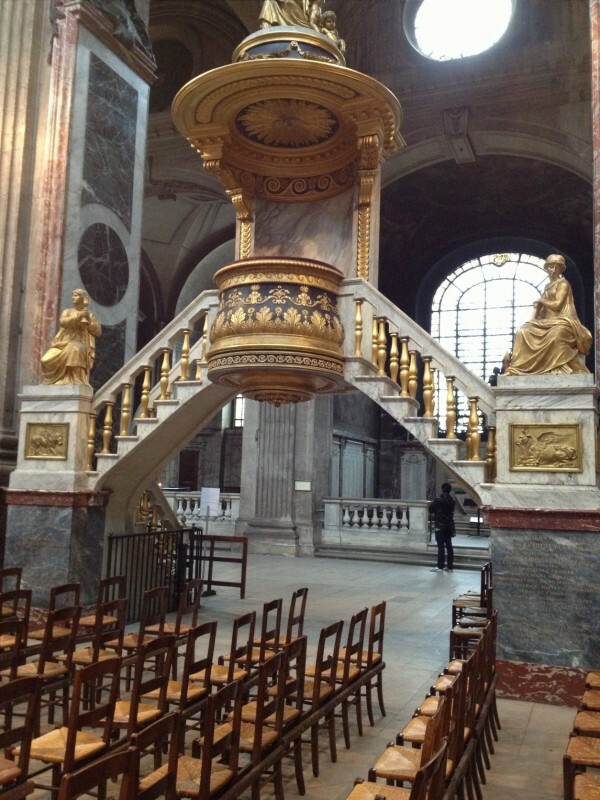 It turns out that in the early eighteenth century, in conjunction with the nearby Observatoire de Paris, the priest at Saint-Sulpice agreed to have an official sundial installed which would help determine the equinox and thus Easter. Apparently, the reason Easter changes dates every year is that it arrives after the first full moon following the vernal equinox. Learn something new every day! Besides this wonderful experience, we also learned from our tour guide that most churches in Paris have free tours on a weekly basis, including three tours a week in English at Notre Dame. One reason I wanted to spend time in Paris was because I never get enough of the city. Being in town for just four or five days necessitates running around, seeing as many important monuments and museums as we can. It always felt like there was not enough time to do more than scratch the surface of what is here. 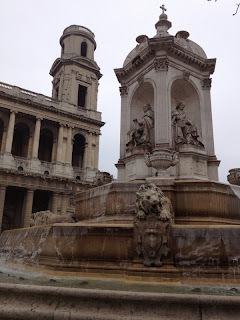 When the opportunity arose for a semester in the French capital this spring, I was delighted. Since arriving in late January, we have gone out just about every day to see as much of Paris as we can. 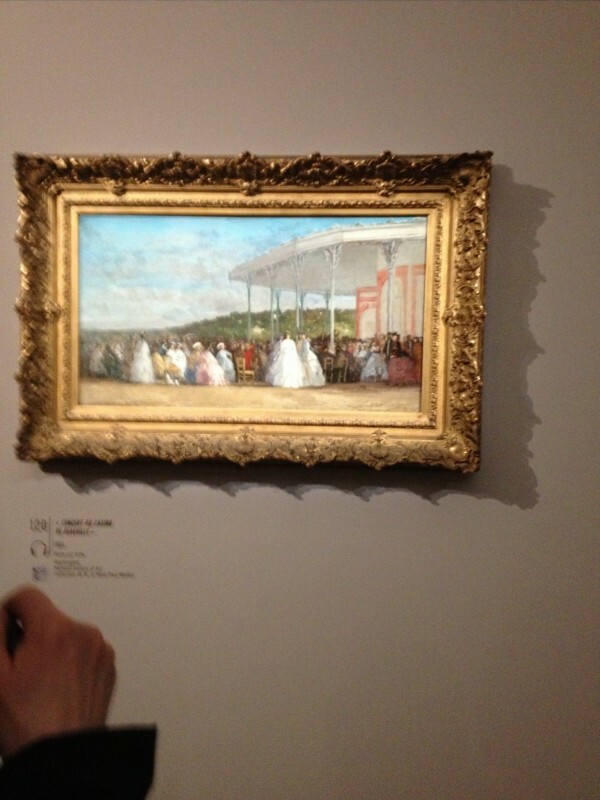 We’ve been back to the Louvre and the Musée d’Orsay to see the Impressionists. We’ve also made our initial visit to the Musée Carnavalet, devoted to the history of Paris, and to Balzac’s house. Mostly we go to museums together, but there have been occasions when my husband has been busy and I branch out on my own. 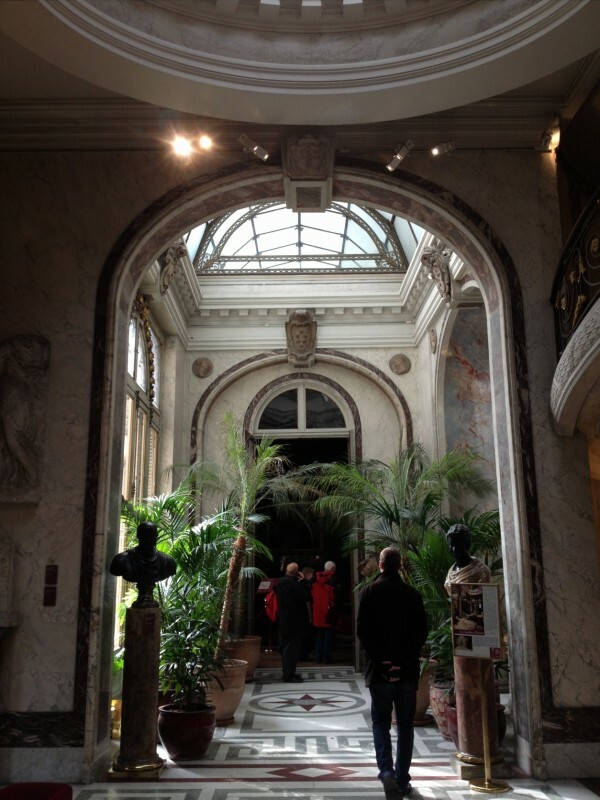 I’ve been fortunate enough to go back to Victor Hugo’s home on the Place des Vosges and I made my first trip to see the permanent collection at the Petit Palais. Yet, the ones I’ve probably enjoyed the most are smaller museums I never knew existed. At the end of February I found out about an exhibit at the house of the painter Delacroix. Given the gray skies and frosty temperatures of the time, I was especially tempted by the exposition’s title: Des Fleurs en hiver—Flowers in Winter. I knew, too, that the museum’s location near the Place du Furstenberg would give me the chance to see that charming square in the 6th arrondissement as well. What I didn’t expect is that the home itself, where the artist lived for the last six years of his life, is very attractive. 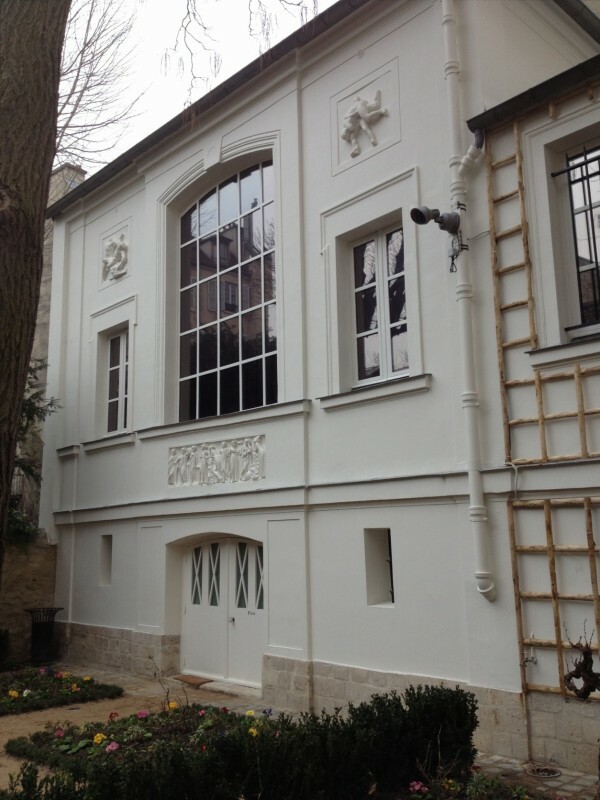 The atelier, a separate structure out back, is bright with large windows overlooking a flower garden. While the exhibit was small, some wonderful pieces showed Delacroix’s talent in these atypical subjects from the 1860s. 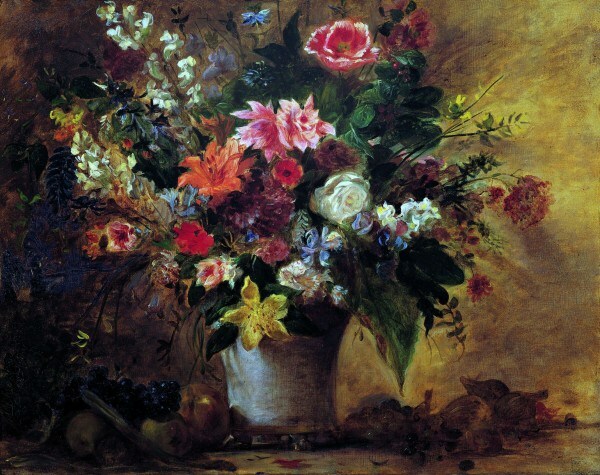 My favorite painting was one he did for his friend, author George Sand. The artist had wanted her to change the spot where the painting was hanging but she loved it so much she left it where she could easily see it from her desk. 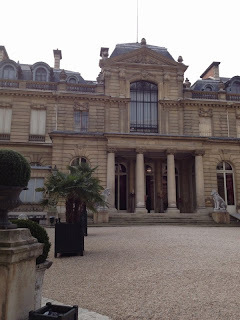 Yesterday I decided to go to a special exhibit at the Musée Jacquemart-André on boulevard Haussmann. 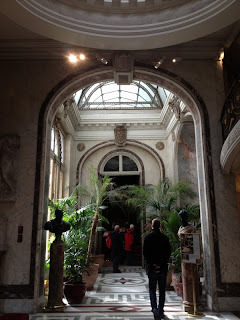 One look at the magnificent hôtel particulier that now serves as a museum got me wondering if the art would be as fine! (See the mansion pictured at the top of this post.) Built for Édouard André in the second half of the nineteenth century, the estate is as beautiful on the inside as it is outside. André and his young wife, painter Nélie Jacquemart, decorated it lavishly and filled it with art. Until mid-July, it is the setting for a retrospective of the art of Eugène Boudin. Paintings, pastels, and watercolors are spread out over eight rooms showing the skill of this pre-impressionist artist. I was overwhelmed by the work of Boudin, the painter Corot called “le roi des ciels”—the king of the skies. In my extremely limited introduction to drawing and painting, I know how hard it is to portray clouds, not to mention rocks and beaches. I loved Concert au Casino de Deauville which shows attention to the detail of the women's dresses and the bandstand as well as the sky. We are really enjoying ourselves so far. I'm sure Paris will continue to impress! Why, Oh Why, Do I Love Paris? Ask anyone who’s ever been to Paris and they’ll tell you what a beautiful city it is. The many well-known monuments—such as the Cathedral of Notre-Dame and the Arc de Triomphe—seem to spring from their setting, easy to admire from afar. The metropolitan area as a whole has a uniformity of style to it. Elegant buildings abound, some with special touches like caryatids (pillars in the shape of human figures) or sculptured grapevines on the façade. The two people responsible for transforming mid-nineteenth century Paris into the city that it is today are Emperor Napoléon III and the city prefect Georges Haussmann. The emperor, wishing to beautify the French capital after a visit to London, wanted to create a more healthful environment following the cholera epidemic of 1832 as well. His idea was to clear out some of the medieval structures to allow air to circulate better downtown. Napoléon III also knew the political advantage of sending the rebellious poor out to the suburbs and bringing wealthy Parisians intra-muros, that is within the city walls. He gave the onerous and lengthy task of renovation to his prefect. 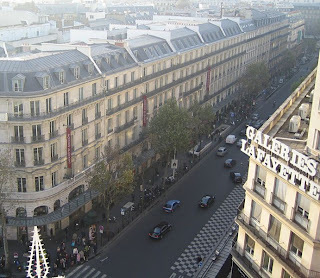 Haussmann, obsessed with creating perspectives through the use of right angles, spent eighteen years destroying thousands of old houses, putting in broad boulevards, gardens, squares, and new parks. The destruction of certain buildings and the high cost of the project were, and for some continue to be, quite controversial. The very strictly imposed architectural style, now referred to as haussmannien, accounts for the distinctive appearance of Paris today. While it is quite unusual to find remnants of what Paris was like before Haussmann, it is still possible. Take covered passageways, for instance. Built to protect shoppers from the filth and mud of old Parisian streets, they numbered in the hundreds before the Haussmannian transformation. The twenty or so which remain date from the first half of the 1800s. Many can be found between the ninth and second arrondissements. Some of them, like Verdeau, Jouffroy, and Panoramas, follow in quick succession; you don’t have to stop and orient yourself before going on to the next one. Strolling down these walkways is like stepping back into the past. Besides the nineteenth-century clocks, signs, and woodwork, many of the passageways have glass ceilings, allowing in lots of light. 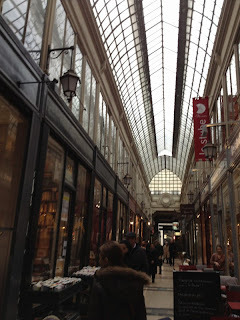 Shops and eateries of all kinds line the sides of each passageway: bookstores, tourist shops, even an Internet café. 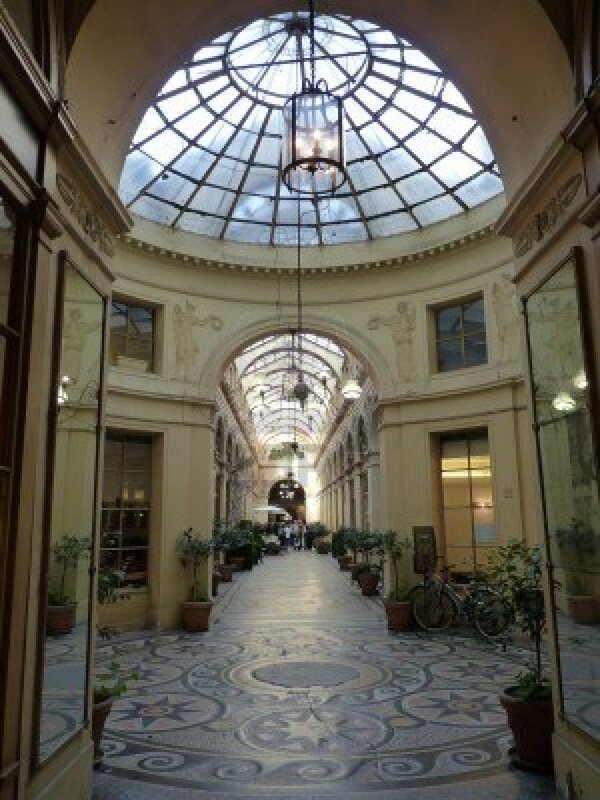 Perhaps the nicest passage of all is the Galerie Vivienne, built in 1823. Even the use of the word galerie in its name indicates its higher standing! 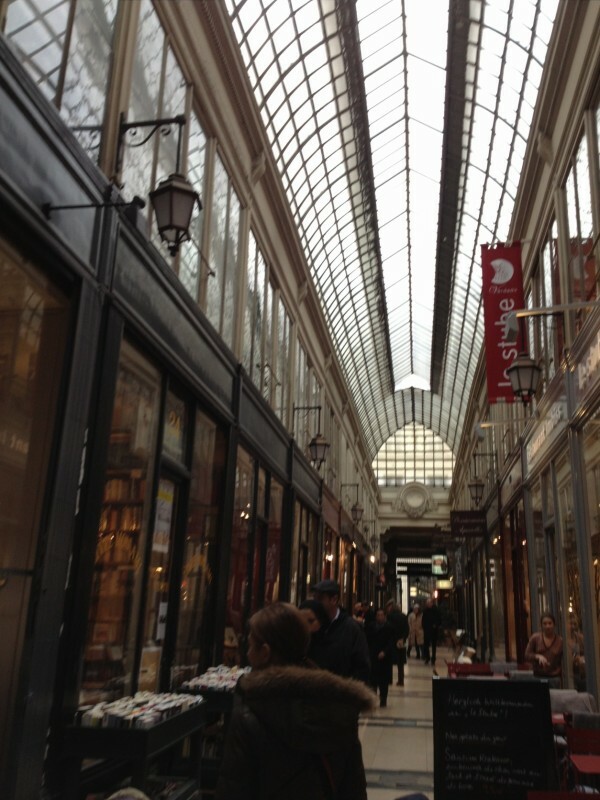 Situated between the Palais Royal and the Bourse, it has three entrances—off the rue Vivienne, the rue de la Banque, and the rue des Petits-Champs. 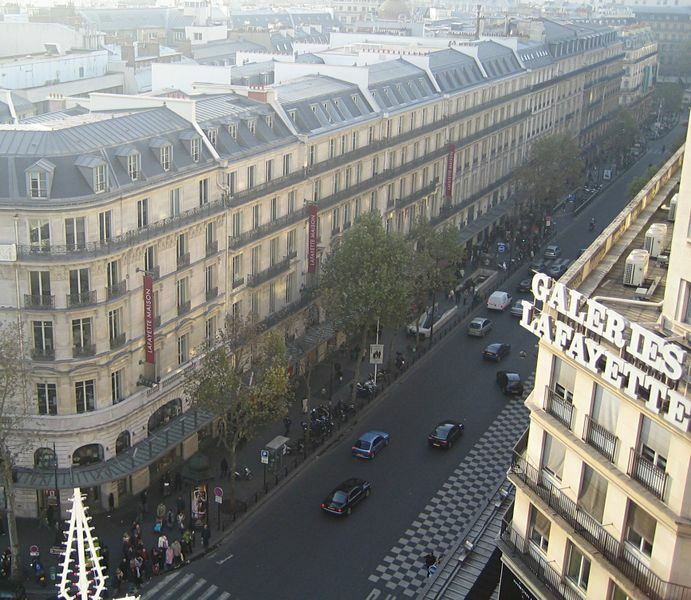 The Galerie Vivienne attracted many customers before the construction of the big department stores began under Haussmann. It is still a beauty to behold. The mosaic floor is outstanding, as are the glass rotunda, the wooden pilasters, arches, and molding. The loveliness of Paris has many sources; it’s fun to discover as many as we can. Vous Avez de la Grey-Poupon?